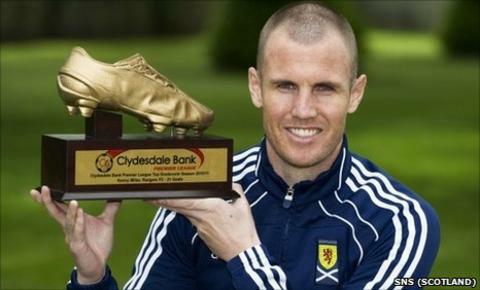 Kenny Miller collected the Golden Boot Award after finishing top scorer in the Scottish Premier League. The former Rangers striker also picked up a championship winner's medal after the Ibrox won their third title. Speaking ahead of Wednesday's Carling Nations cup match with Wales, Miller said the Scots had a score to settle after the 3-0 loss in Cardiff in 2009. "We've got an opportunity to put it right and hopefully get a far better result and performance," said Miller. The last time the Scotland faced Wales, manager George Burley lost his job in in a humiliating defeat, making way for Craig Levein to take over the helm and Miller believes Scotland are heading into Wednesday's match in good shape. "I played in the game against Wales two years ago and the game eight years ago," said Miller. "We lost by three and four so we have a score to settle with them. They were not happy memories two years ago. "It was a poor result and poor performance and it's a game we would like to wipe from the memory. "Any game played against another home nation has a bit of added spice to it and that day we let ourselves down. "It's not about revenge - it's just about getting the right result in this game." Despite his January departure from Rangers for Turskish side Bursaspor, Miller finished as the Clydesdale Bank Premier League's top goalscorer for the season with 21 goals and was handed a winner's medal for participating in 25 of the matches that helped the Ibrox secure their third successive title. And he believes Wednesday's match against Wales is an ideal opportunity to focus on the national team after enduring a difficult time in Turkey since his mid-season move. "It's been a tough three months for me across there but I'm happy with the way things have gone and I've managed to get a few goals," said Miller. "It's been difficult to be fair. There has been a lot of time away from the family, it's a different style of football and it's a different mentality so it has taken a bit to adapt. "The adrenalin gets you through the first three or four weeks and you can run off that. But, when you realise just how different it is, it's been difficult at times." "But it was a wee bonus for me at the end of the season, hanging onto that top goalscorer. "It's something I never expected having left in January but it's always pleasing. "The way things were going, I was playing in a good team, we were creating a lot of chances and I was playing regularly and getting on the end of those chances. "To get 30-plus league goals would have been great but I had a decision to make at that stage and it was one where I had to go."